There were two girls in the attic of the German House at Sewanee. One was from Leipzig, and the other from Budapest. Neither was happy. In the corner of the attic where they would be storing things for the next year, there were spiders. These were not the nice, gentle Eurospiders of their homelands, but nasty, vicious American spiders--spiders that could bite and maim. American spiders have nasty venom, and nasty ways of delivering that venom into your body. Annika and I giggled as we listened at the bottom of the stairs. Well, yes. There are American spiders worth fearing. The Brown Recluse and Black Widow are two notorious arachnids. They are distinctively colored and patterned and so easily identified, but they do lurk in dark places. Europe is not without its own spidery pests. There are widow spiders and comb-footed spiders throughout Europe. They are not really a big threat, though. I guess the girls were right. If you want really venomous things, though, we often think the best place to find them is Australia. The venom of the Northern Funnel Web spider is quite potent. Then again, it is not the worst. The most venomous spiders are in South America. Consider the Brazilian Wandering Spider. And tremble. Then remember that you don't live in Brazil and rejoice. Anti-venom is a help, in most cases. So there you go, girls. Don't worry. Much. 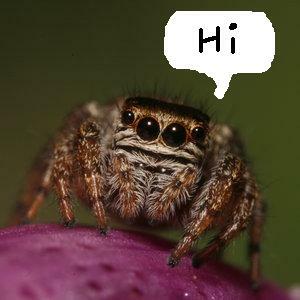 One of our favorite pets is the jumping spider. Catch one if you can, and watch it for a while. Watch an orb weaver in your garden, and feed it! And if you find one in the house, put it outside, don't kill it! You can do it from a distance with this handy tool. I love audio books, and when Audible came on the scene, it fast became a favorite. Back in the old days, the website was painfully slow, and downloads were slower. Once downloaded, transferring audio to a portable device--a Pocket PC at the time--took forever, and and could only be done in small segments due to the small memory capacity. Burning content onto CD was worse, with temperamental burner technology and cheap blanks. Stone knives and bear skins, really. Save 50% for 3 months - Download and Listen to an Audiobook for only $7.49 today! Today, downloads are almost seamless, very fast, and Audible's customer service is the best on the 'net. They even employ humans. And my personal all time favorite: Out of the Silent Planet and the other two in the Space Trilogy.